Born into poverty with no hope of improving his situation due to class and opportunities, Balram, a driver for a rich family discovers that if he is willing to lie, cheat and murder without fearing the consequences he can live the life he has always dreamed in this new emerging India. The book is told in a series of letters from Balram to a Chinese official who will be shortly visiting India. Balram wants to set the record straight and expose India while at the same time telling his story on how he rose to the position he is in now. The narrative is easy to read and quite clever in parts. Balram is a man who has had opportunities denied to him throughout his life (including being taken out of school) and he has a sense of pure anger throughout much of the book. A lot of the anger is entirely justified yet he also has very little regard for his family and refuses to send them any money even though working as a driver he is earning the equivalent to a fortune compared to his struggling family. He also tries to expose corruption within politicians, business men and the police yet will also rip off his employers when given the opportunity showing that he's certainly willing to play the game when it suits. position by intelligence but by understanding the ‘jungle’ in which he lives in. Unfortunately some of the other characters came across as rather ‘flat’ especially Balrams employers and his family and they failed to evoke any sympathy from me, they were very stereotypical although maybe the intent is that they are seen as through Balram's eyes? 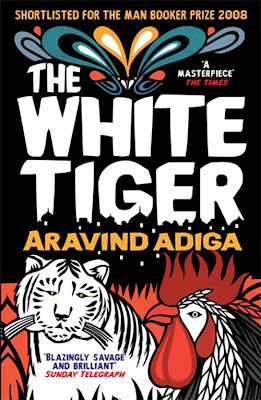 This White Tiger never ‘preaches’ but there are a lot of books coming out at the moment which all claim to highlight the dark side of India. So unfortunately in that respect this book will not give you anything new. Would I recommend it? It is a very easy read and I found it highly entertaining and I would recommend it for these reasons but don’t expect to find anything more meaningful or a balanced view of India within these pages. Your last paragraph sums up beautifully all the things 've read about this book. Everyone seems to find it quite entertaining but with little of meaning happening. Personally, shallow of me I know, but I don't like the cover. Actually, I absolutely LOVED this book and everything else he's written. I'm so sorry to hear that you found it kind of flat! I'd never heard of this before, but it sounds like something I might enjoy. Petty - oh I quite liked the cover, althugh that type of cover does seem quite fashionable at the moment. Nancy - I didnt find the overall book flat just some of the secondary characters but as it was told from Balram's point of view I wonder if this was intentional? I found it fun and entertaining to read overall though. Zara - I think alot of people would enjoy this book as its an easy read. I'm with you. This one fell flat for me. I'm glad I read it, but I wouldn't recommend it. Jackie - I have to admit I was hoping for a more meaningful read for a booker prize winner. I dont know what the other books in the short list were that year, was it a slow year? Avid Reader - it played very much to the 'slum dog' crowd a little. I am also glad I read it. We are a married couple and we live in Surrey in the UK. Inbetween working and looking after our very active toddler we both read. We both read very different genres of books so hopefully there is something here for everyone. Who needs the Booker prize?